Is your employee’s performance not at par with the company’s expectations? Or is your company behaving in a manner that you consider as not beneficial for the welfare of the company? Are you an employer having a tough time figuring out how to end your employee’s contract? You have come to the right article! We have gathered a few guidelines and tips on how you can terminate an employee’s contract in a professional and ethical manner. 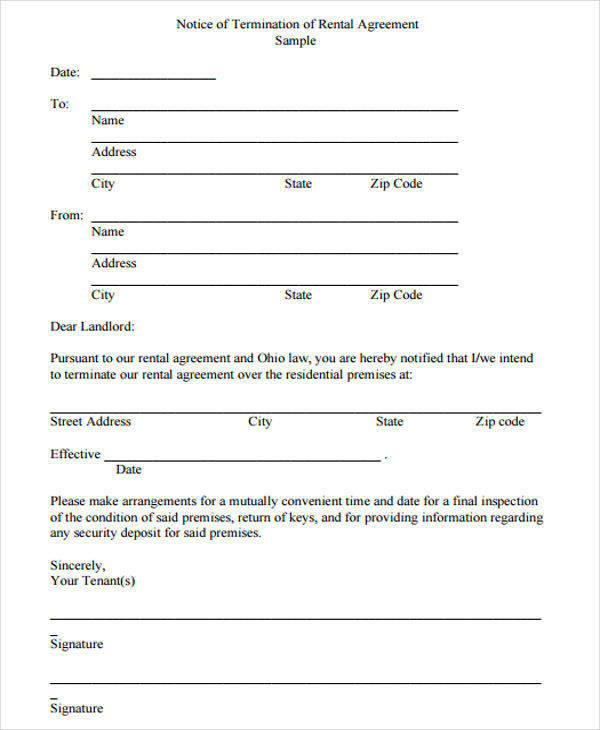 Plus, we have a few sample letters in PDF and in Word Document that you may want to use as a reference for when you need to know what the proper termination letter format is. 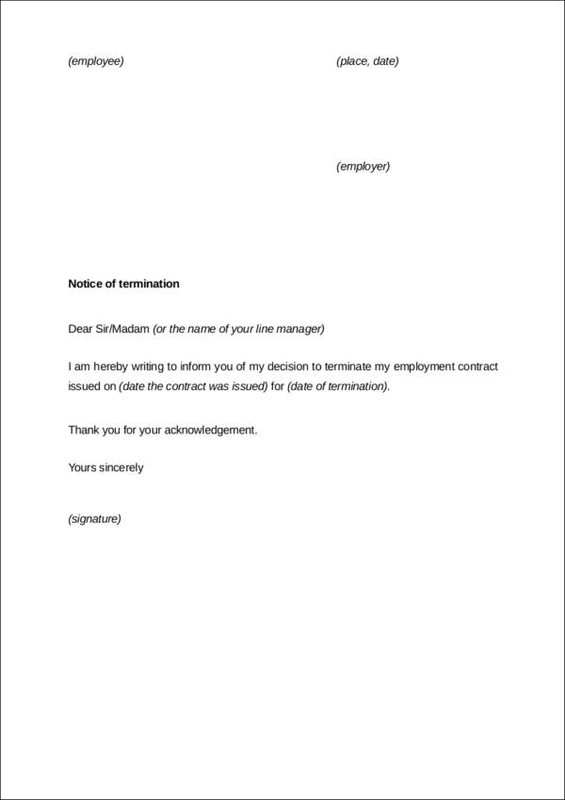 These contract termination letter examples are all for free and are easy to download. 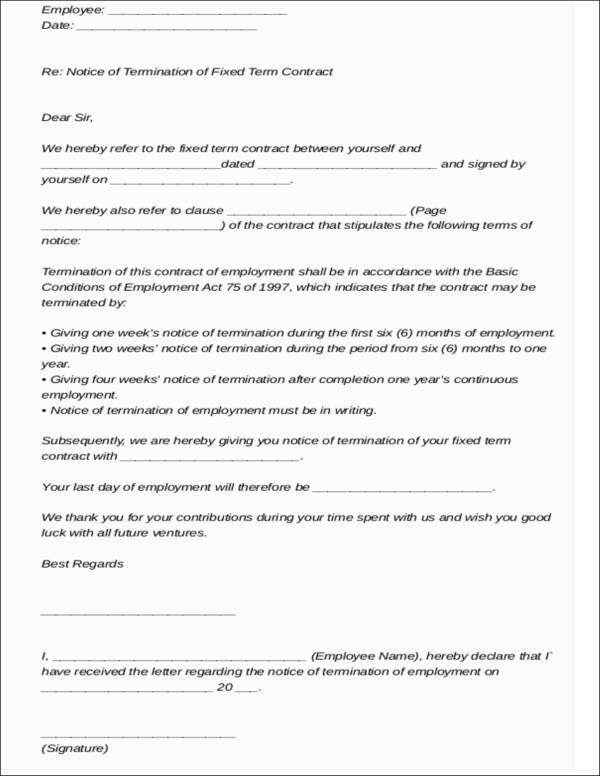 Keep reading and let us find out the basics of terminating contracts in the workplace. When it comes to firing an employee, you have to make sure that you did fire that certain employee for reasons that are justifiable and not because of your distaste toward a specific class of people a.k.a. racism. Even if these are considered to be minor behavioral problems, they do impact the functions of your business to a great extent if done constantly. Results from these behaviors can lower the morale of the rest of the workforce, which can result to your business to earn low profits, health risks, safety, and the overall reputation of your business can get tarnished. Make sure that you address these behaviors right away and enforce the proper sanctions before it gets too late. Getting rid of problem employees in the workplace can be the solution to making the productivity in your company way more efficient and smoother than ever. However, it may not be as easy as it seems. Nowadays, employees are more aware of what they are entitled to and what their rights are as an employee. You do not want to be one of those employees who will get a lawsuit because of wrong discharge. You need to ensure that when you are firing an employee, you are doing it in a legal manner. Follow the guidelines we have gathered to ensure that you are able to let go of an employee gracefully and properly. If employment agreements are verbal or if there is no physical employment contract, this means that workers agreed to work with the company “at will.” An at-will employment means that an employer has the right to let go of an employee any time he/she wishes to do so. However, at-will employments now have limitations. Discrimination. By law, employers are not allowed to terminate an employee due to discrimination. Whether the discrimination is because of race, age, religion, disability, or even sexual preference. Policies imposed by the state or law. Should you be violating any public policy and your employee tells, you are not allowed to fire him/her due to this. “Just because.” When you tell your employees that they will only be fired for justifiable causes only, do as you promised. You are not allowed to fire an employee just because you do not want to be working with him/her. Your causes still have to make sense (i.e., tardiness, insubordination, etc.) and should still have proper documentation. During the job offer, you are supposed to let the employee know what is expected from him/her. A breakdown of what his/her duties and responsibilities are and what needs to be accomplished on a daily/weekly/monthly basis. You should also let the employee know that the duties and responsibilities he/she has are subject to change. Make sure everything related to the employee’s job is clearly stated and that any violation of the stated duties and responsibilities will have a specific sanction or notice. Clearly stating the job description of the employee helps to them to make all the appropriate corrections that are necessary. However, some employers might let their employees sign an employment agreement form stating that employees might be fired without cause. This can leave a gap between you and the employee compared to a contract that promises a termination that might be due to a cause. More often than not, employers typically promise their employees that progressive discipline is to be imposed for mistakes. Employers who fail to deliver such promise face a hard time defending themselves from the court. Employees who file lawsuits for such failure often state that they were terminated and treated unfairly. This is why it is important that proper disciplinary actions be properly enforced in the workplace. You may also opt to have the company policy or the employment contract clearly state that your company is allowed to immediately fire employees who behave in an intolerable manner. How to properly impose progressive discipline? Start with oral warnings or warning letters. If the warning was disregarded or if the employee continues with the behavior, suspension may be applied to that employee. 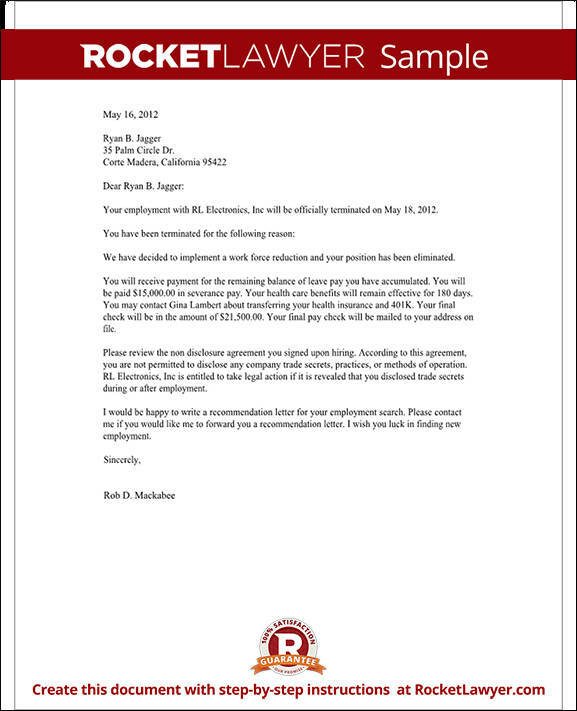 Should the employee continue with the unacceptable behavior even after suspension, termination can be applied. Making sure that progressive discipline is followed helps to ensure that the behavior or wrongful doing of the employee is properly documented. This way, the employee will not be taken aback or will not be surprised as to the reasons why they were terminated from their post. It also lessens the chances that you will be receiving a lawsuit against termination that is considered to be wrongful. Be careful with the words you use when it comes to firing your employee. It may be used against you. Just make sure that you follow proper business etiquette. Be prepared with your documentation and set a meeting with the employee. Stick to the facts and make sure these are well stated in the contract termination agreement letter. While it may be tempting to use harsh words, you should control yourself and remain professional in the situation. An Exit Interview Is a Must! Refer to a few sample exit interview forms in order to conduct a proper exit interview. While it may seem a waste of time, the feedback or the input that you get from the employee through these interviews can be helpful when it comes to implementing changes or knowing which areas are in need of more attention. 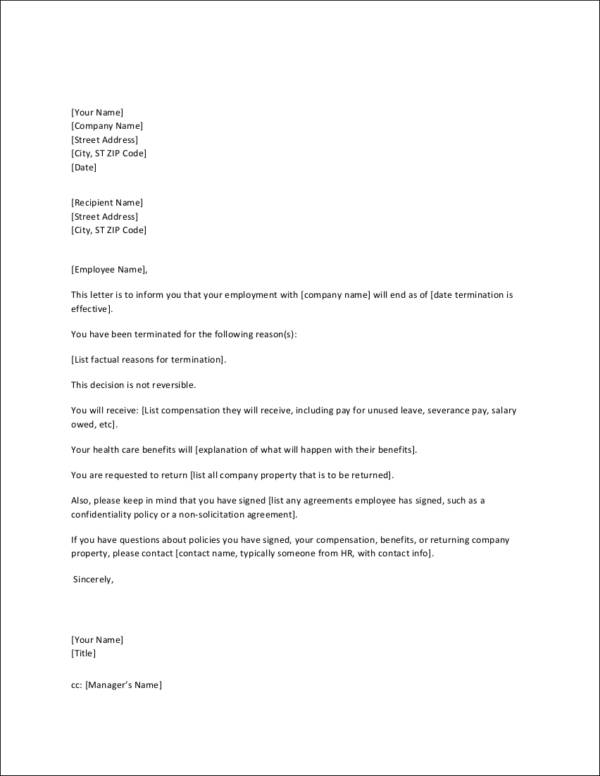 It is no doubt that termination letters for the workplace is one of the best ways of letting someone know that their services are no longer needed in the company. It helps to explain the reasons why the decision was made and it will clear up any question that the employee may have about the termination. 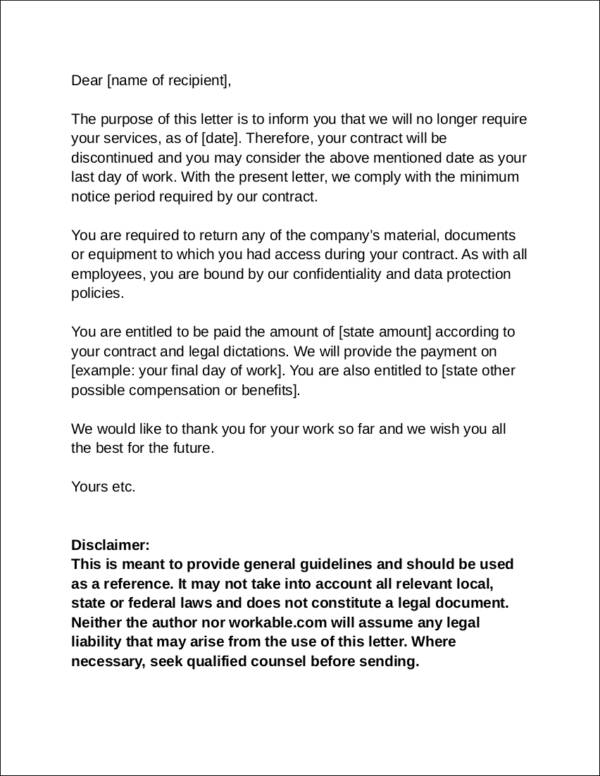 In cases of lawsuits, this letter will also be one of your best defenses to use against it. So it is important that this letter be formatted properly and written well to ensure that the message gets across smoothly. Start with the company letterhead. If the company has an official stationery with a letterhead, this is best to be used for this situation. If a letterhead or stationary is not available, start with your details or the details of the person handling the termination. The date when the letter was written follows. 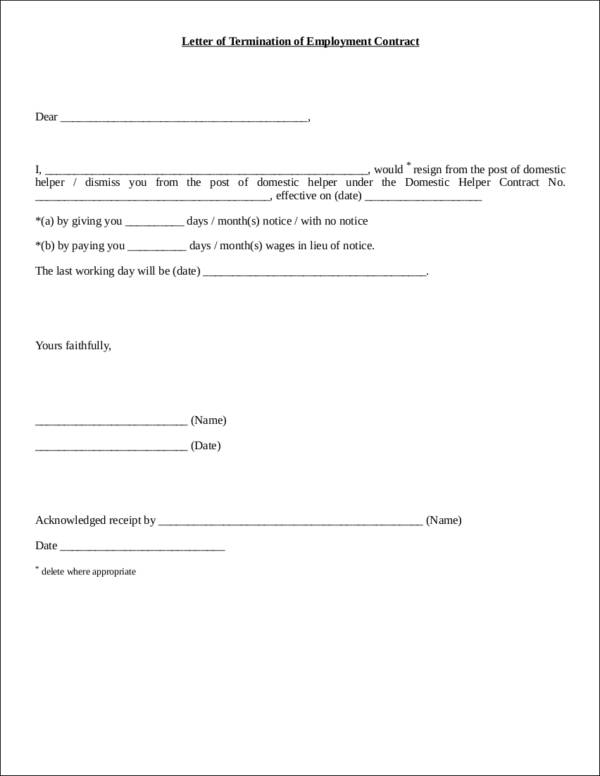 At most, two spaces shall be allotted in between the letterhead and the date. Two spaces after the date, write down the employee’s details. A subject line after the employee’s details is needed to make it clear to the employee what the letter is about. Start with a good opening greeting. Paragraph #1. Immediately state that the employee is being terminated. Sound empathetic about the situation. Paragraph #2. Say sorry for the inconvenience the termination may cause. State the reasons for termination and the actions taken before the termination decision was made. Paragraph #3. End on a good note and appreciate the effort they have put for the company. End with a strong closing. Write your name, position, and sign above it. The wisdom of life consists in the elimination of non essentials. We hope you learned a lot from this article and we hope to see you on the next one!